To start with, he didn’t have much in his CPF when he retired 15 years ago; he had barely $10,000. All of it was spent in the last 15 years, with most of the money going to his children’s education. This is the story of a seemingly lucky man, Teoh Kun Chen. The 70-year-old could withdraw all his savings in one lump sum at 55 because he belonged to a generation that did not have to grapple with the ordinary account, retirement account, and Medisave. “My CPF saving was very small because I wasn’t very educated when I was young. I didn’t earn much. I worked as a cleaner. There were times I worked as a road sweeper. Teoh has two sons. His wife passed away when he was a young man. Today he says his sons have to care for their own families. So he has to take care of himself. “At first [after turning 55], I still worked a little here and there. I was like semi-retired. Sometimes, I worked as a waiter at a Chinese seafood restaurant. “Five years ago, I could not find jobs. I approached many places, but I tell you, when they know that you are 70 years old, they don’t want to employ you. As time passed and Teoh still could not find employment, his savings ran dry. So in the beginning of this year, he decided to be a rag-and-bone man. He wakes up at dawn and pushes his cart around his neighbourhood at Telok Ayer. By noon, he sits by the side of the road and sorts out his daily collection. 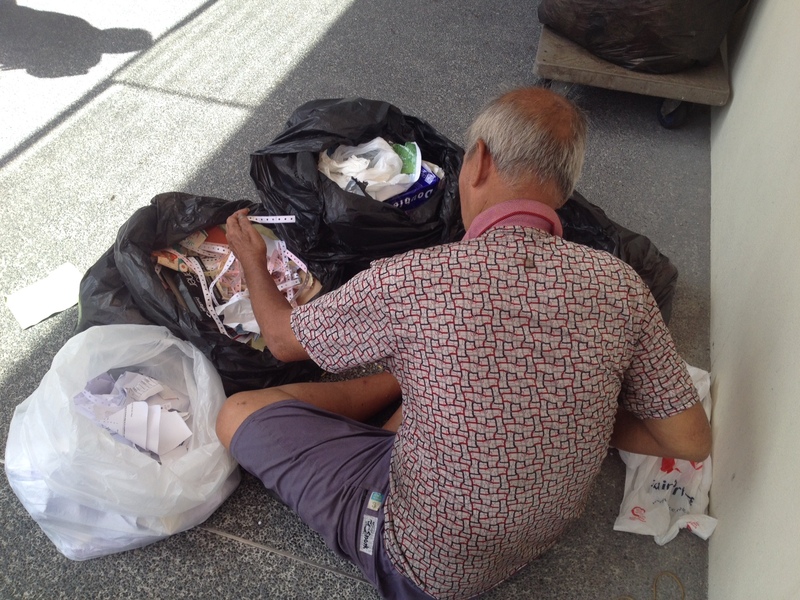 At 2 pm, he heads off to the middleman, who pays him a stipend of $15 to $20 for his daily bags of plastic and paper. Then he heads over to one of his friends’ place to spend the night. He owns no property. Teoh is a man who lives by his own philosophy – he never wants to seek help from welfare organisations or government agencies. He does not want to hear the phrase Pioneer Generation package. “I have hands and legs. Why do I need your help? “Look young lady (he looks at me), I have seen everything in life. I am 70 years old. When you ask for help, people always expect something in return. If I ask the government to help me now, and they come up with some new policies in the future, I might end up paying them back a lot more. He sounds bitter, I tell him. “I was very happy once with my wife and young children. But happiness is not for old people. In life, people got to be resilient. Don’t take people’s money. Don’t beg. 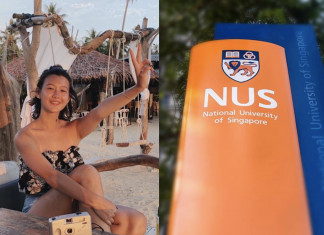 “In Singapore, whatever money you have is always so small and it is never enough. So I stop thinking about money. I stop thinking about happiness. As he sorts through his collection of unwanted items, he points to me. This one can sell for more money, he says. He pries the plastic cover of a notebook and drops it into a black bag. But this one cannot, he says as he tosses some paper wrappers into another black bag.